In the military there’s general issue gear and then there’s the stuff you’d have if you didn’t get everything from the lowest bidder. Innovations and improvements usually happen in the civilian world first. Though there’s still good reason to stay with the proven designs like the Ka-Bar fixed blade knife, many companies now offer excellent high tech alternatives. 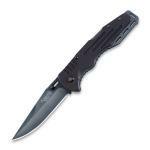 Modern tactical folders also lock blades into the open position nearly as solidly as heavier fixed blade knives. 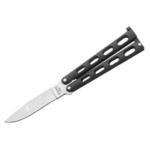 Blades themselves may snap before the lockback of a well made folder fails. Keeping such a knife clean and in top condition is as important as regular care of any firearm. Though there are many good high tech tactical knives, some experts recommend simpler builds over technically advanced designs. Two of the most famous OSS agents of World War II spent years refining the perfect tactical blade — their legacy, the Applegate-Fairbairn fighting knife, is a simple fixed blade dagger. Few of us can argue against the practicality of a knife that opens with one hand. Our choice for the best tactical knife is the H&K Tactical Folder gives ordinary citizens a serviceable one-hand opening plain edge blade built to more professional standards — and it has a handy pocket clip. 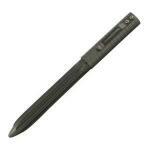 The Meyerco 18-XRay can’t be confused with a penknife. 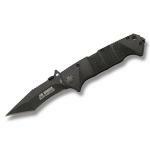 This fully automatic switchblade with black anti-glare coating and combo edge tanto blade is very clearly a fighting machine. A new style of fixed blade, the TDI Knife series by Ka-Bar, available in belt or ankle versions, conveys an efficient fighting style through the well designed pistol style grip. 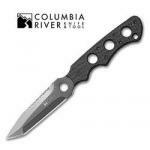 The Cold Steel Point Guard neck knife looks like it could even be practical for more than a last ditch threat. With serviceable G-10 handle scales and a minimal grip that works well, this is more than the knife you hope you'll never use. 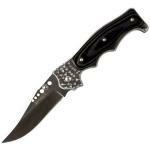 In May 2010, Blade Magazine listed Benchmade's 585 Mini-Barrage among the most popular knife choices for women. This Warren Osborne design is for women or men who want the functionality of the full-sized Barrage in a small package. 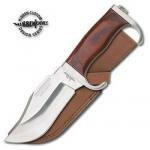 The Swamp Rat Knife Works Hairy Carry was designed as a high performance fixed blade in a size matched to everyday uses. 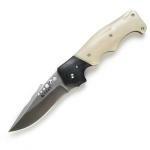 Made to wear on the belt, this full tang knife features the rugged design details of Jerry Busse's tactical knives. 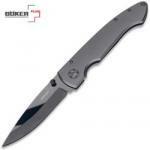 Gerber's Fast Draw Knife is one of the company's first knives to include the F.A.S.T opening system. This inexpensive pocket clip folder opens with the convenience and speed you'd expect from a more expensive automatic. For those privileged to carry a tactical automatic knife, the Benchmade Infidel 3310 offers the same intimidating features as the earlier Infidel 3300, but with a single edged blade that's easier to use in ordinary work. 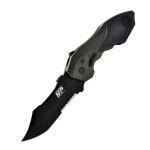 The Ka-Bar Besh BOGA Neck Knife is the production version of a women's self defense knife designed by Canadian Special Ops soldier Brent Breshara. The Besh BOGA features Breshara's unusual "Besh Wedge" point -- a strong design which puts a third cutting edge on the dagger's chisel-shaped tip. The Kershaw Indian Ford combines useful modern features with a look that reminds us a little of the classic barlow pocket knife. The traditional look isn't all there is to the Indian Ford -- this modern gentleman's pocket knife has some of the quality of larger and more dangerous blades. The Kershaw tactical knife called the Black Shallot at first looks a little too sleek if you're accustomed to blocky, tactical knives. You won't see the usual marks of a dependable knife -- no cross-hatched handle slabs or overly heavy blade -- but the dependability is still there. The 6-3/4-inch Becker Necker, now produced by Ka-Bar, seems a bit much to hang around the neck. Though it's better suited for fixing to gear or hanging on the belt, the BK11 outshines many neck knives by simply being enough knife to actually use. The Uzi EK Battlefield Commander does have an interesting high-tech look but comes up slightly short in durability. 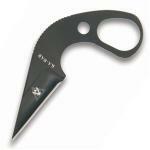 Balance the trendy blood groove against the knife's good features and make up your own mind. The UZI Special Forces Set includes a tactical pocket knife, compass, watch, and an LED flashlight. Overall, it's a good deal and a handy emergency kit for anyone's pockets. 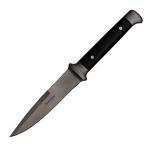 Many cheaper versions of this knife are available, but the Black Sentry Spear Point Trench Knife is the least you should consider. 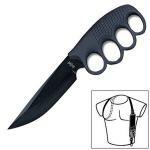 If a combination knuckle duster and dagger fits your lifestyle, you need at least this much knife. 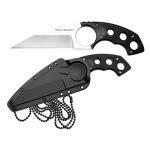 The Pathfinder Combat Tactical Knife from United Cutlery might be a better choice as a camp tool or an emergency knife for the car trunk. It's big and impressive, but it's heavy. The compass comes up to military standards, but only if you're into WWII surplus. 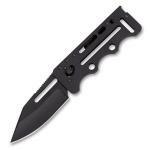 Thumb-stud opening and smooth action complement the high carbon stainless steel blade of the Gerber AR 3.0. 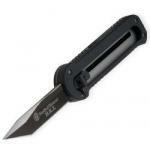 This tactical black folder fits the pocket of anyone who needs a handy utility blade capable of much more than opening boxes. 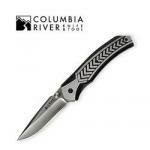 Columbia River Knife & Tool outfits the Lift Off 2 with both Outburst assisted-opening and Firesafe lock. Included in many of CRKT's newer folders, this combination approach finally makes legal one-handers fast instead of just awkward. 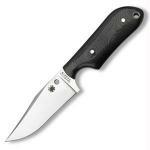 The Paul Defender from Lone Wolf Knives won Blade Magazine's 2009 award for Overall Knife of the Year. Termed the Gentleman's Tactical Folder by the manufacturer, the Defender is a collaboration between Lone Wolf's designers and Paul Poehlmann, inventor of the Paul Axiel lock. The smallest knife so far in the Ka-Bar TDI series, the Tactical Defense Institute LDK neck knife could actually be stored in your wallet. 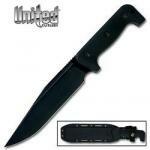 The Last Defense Knife isn't much larger than a credit card and wields a wicked cutting edge just 1-5/8 inches long. Ka-Bar made the FIN Folding Frame Lock Knife in both drop point and tanto blade styles and offered a choice of combo-serrated or plain edges on each version. 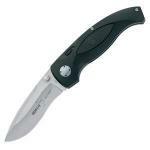 This combo-serrated drop point FIN offers very little plain edge for fine cutting. Make sure it fits your purposes. The Byrd Meadowlark with G-10 handle combines one of the best tactical knife handle materials with a popular pocket folder design. G-10's good insulating qualities and resistance to all types of chemicals add to the Meadowlark's already practical features. Designed by Chad Los Banos and manufactured by Boker, the Hyper streamlines one of Los Banos's earlier knives -- the Subcom. Built thinner but just as solid, this 3.2-ounce, one-handed opening knife slips neatly into the pocket with a barely noticeable profile. 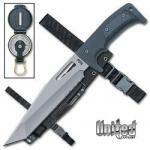 The biggest attraction of the Smith & Wesson SWMP5LS Liner lock knife isn't the upgraded design. What makes this five-inch (folded length) beast popular is the MAGIC Assisted Opening system. 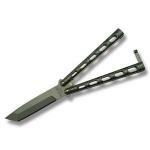 Currently, it's one of the closest substitutes for an automatic opening knife that civilians are allowed to own. SOG's FF-11 Salute -- which the company refers to as their first Fusion tactical folder -- puts all the technical expertise of that innovative manufacturer to good use. 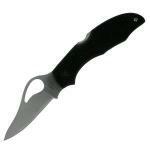 The result is a high-tech knife that isn't tough to understand, with a few unusually good features. Designed by Jim Hammond, the Operator's Model A.B.C. 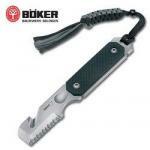 (All Bases Covered) knife adapts Hammond's popular fixed blade diver's knife design to land use. With full-length cutting edges both plain and serrated, this rugged outdoorsman's knife covers every situation. Cold Steel's Double Agent knives, designed by Zach Whitson, are available in two blade styles. 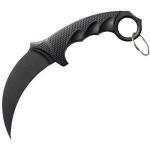 Either the karambit or the clip point version may be safely worn as a last resort neck knife. Smith & Wesson's H.R.T. 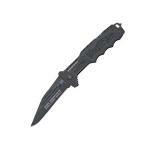 O.T.F (Hostage Rescue Team; Out The Front) knives aren't quite as dramatic as their names, but they are useful. Check them out if you're looking for an assisted opening version of the classic stilletto. Scaled down to only two thirds the size of the popular Spyderco Military knife, the ParaMilitary meets the needs of those who need a more discreet version better suited to pocket carry. 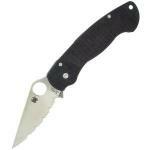 This model created for civilian uses keeps the good features of Spyderco's larger tactical folder. Designed for Spyderco by Fred Perrin, a world-ranked martial artist and ex-French commando now making knives in Paris, this small fixed blade incorporates some excellent military ideas but still fits civilian use well. You'll find the sheath equally handy.